Image: Stalag Luft III 1942, from the collection of the Imperial War Museum © IWM (HU 21018). Australian fighter pilot John Williams DFC was shot down in 1942 and became a POW in the notorious Stalag Luft III camp in Germany. John had joined the air force shortly before the outbreak of war and, in the larrikin tradition, led his squadron into air combat over the deserts of Libya and Egypt dressed in sandals and shorts. John and his best mate Rusty Kierath were among the 76 POWs who tunnelled their way out of the supposedly escape-proof camp under the noses of their German guards in what later inspired the Hollywood blockbuster, The Great Escape. Their families never learned what really happened once the pair made it out into the forest. John’s niece Louise Williams has pieced together his life, from his upbringing in a tight-knit family hit hard by the Depression, to his exploits in the air, and the many missing details of the tragic escape. It is a powerful and intimate story of one of the most dramatic episodes of World War II. Louise Williams is an award-winning writer, journalist and editor, and niece of John Williams. She has recreated John’s story from family memories, letters, declassified documents, oral histories and interviews with survivors of the Great Escape. Shot down and captured by German forces during WWII, Louise William’s uncle, Australian Squadron Leader John Williams DFC found himself a POW at the infamous Stalag Luft III in 1942. Two years later, he was one of 76 prisoners who participated in the daring Great Escape from the camp through a series of tunnels. 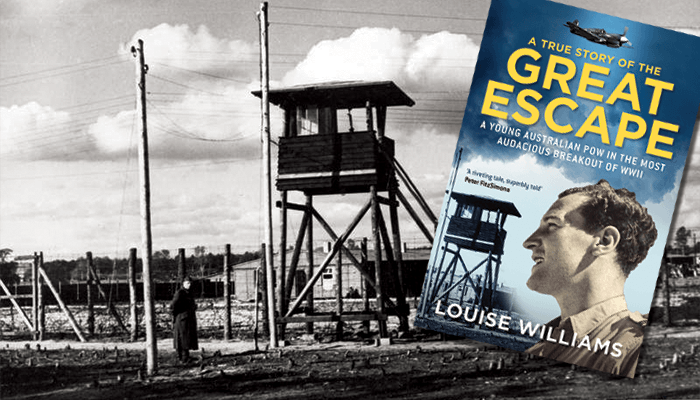 Join Louise Williams for a fascinating talk about piecing together her uncle’s story, his upbringing through the Great Depression and the harrowing events of the Great Escape — a tale that later inspired a major Hollywood motion picture!